COME LIKE US ON FACEBOOK AND YELP! Serving great food for over 20 years! Located in beautiful Contoocook, Dimitri's has been family owned and operated for 20+ years! Dimitri's Pizza is located in Contoocook, a village within Hopkinton and within a stone's throw of several sites of interest including the Contoocook Railroad Bridge and the Contoocook Railroad Depot. 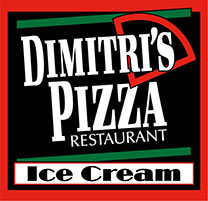 Dimitri's Pizza has a casual, family dining atmosphere which everyone can enjoy! Don't forget to stop by during the summer to try our home made, locally created ice cream at the front service counters and enjoy a view of the Contoocook River while dining at the outdoor seating area!